Ageing can be a beautiful thing: after all, it happens to the best of us! We all want to age gracefully and let our physical appearance reflect the newfound confidence that comes with growing older. There are so many things we do every day that can really age our skin, but by making some simple changes to your daily beauty routine, you can help slow down the hands of time. Too often people have a disorganised approach to their skincare regime and will buy random skincare products that don’t synergistically work together to produce a desired result. This is usually due to a lack of knowledge of proper skincare when it comes to premature ageing. For example, new clients who come to me will often focus to much on one ingredient – all their products will have glycolic acid as an ingredient. This results in far too much of one thing. In this case, their skin is over resurfaced and ends up dry and red. Also using too many products on your skin will over-stimulate, causing status cosmetics — which simply means your skin can’t process so many different molecules and ends up irritated and confused. To ward off premature aging you need a systemised approach to your skincare regime, I recommend seeking professional advice from a knowledgeable skincare professional, on how to combine your favorite products in a simplified and safe manner that consistently delivers results. Need help? Our customised skin shots can be mixed and matched with your moisturiser depending on your skin type, to help target specific concerns. STOP STANDING IN THE SUN. Inflammation is at the heart of premature ageing, so be sure to regularly apply a broad spectrum sunscreen. UVA is referred to as the ageing ray in the beauty industry and for good reason! Every minute you spend sunbathing it is slowly undermining your internal scaffolding your collagen and elastin fibers. Our skin is a very delicate weave of protein fibers, much like a fabric. These collagen and elastin threads keep your skin soft and supple and smooth. To much exposure to the sun breaks down these fibers turning them into shredded wheat, all of which translates into the dreaded wrinkles, age spots and sagging. Don’t forget your neck and hands! These are often trouble zones for older women and because they’re so easy to forget, they can become a hotbed for wrinkles and age spots. Make sure you’re applying sunscreen regularly, and use an eye cream before bed. If your serious about preventing premature ageing then hydration is key. Think of your body as a human body sponge. If you imagine immersing a dried sponge in water it will instantly soften, re-hydrate and come to life. Correct cellular function relies on receiving the right amount of water. Dehydrated skin loses its resilience and makes us appear older and tired which I write about here, an adequate supply of water intake helps to keep your skin plump and healthy. As we age, our hair ages, too. It can become dry, which is due to our scalp not producing a sufficient amount of oil to keep it conditioned. Ageing hair can also become finer and flatter, and more prone to breakage, the follicles begin to die and fall out. To help avoid a dry scalp and thinning hair, try treating yourself to a scalp massage after your shampoo. Slowly move your fingers in circles around your scalp to boost blood circulation to the scalp and stimulate hair growth. Similarly, if you struggle with greys, don’t trust those grocery store coloring kits. Make sure you’re using a kit that’s personalized for your hair color needs. The real secret to hair care is letting your unique hair guide your decisions. Women with thick, coarse hair will need something different than those with thin, fine hair. Always make sure you’re consulting your hairdresser about what hair needs you have before making long-term hair care decisions. Typically, the makeup you trusted in college can not be applied to your more mature needs. Avoid drawing attention to wrinkles or dark circles by wearing lighter makeup. Neutral eyeshadow with a shimmer conceals eyelid wrinkles and makes your eyes look brighter. If you have wrinkles beginning to crease the edges of your lips, avoid drawing lip lines. 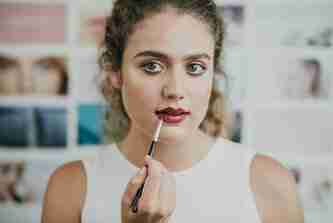 Instead, once you apply your lipstick, dab some on around the edges of your lip with your finger to blur the edges. Or, use an angled lip brush that will make it easier to get color into the lip’s fine lines. Lifestyle changes can arguably be the hardest aspects of a new beauty routine, but also the most impactful (and free!). Making sure you get enough sleep can drastically impact your skin’s clarity, brightness and color. Too little sleep can lead to dark circles, acne, and redness. Simply going to bed an hour earlier or relaxing sans screens before bedtime can help your body update its systems and avoid dehydrating your skin. Another change to make: turning down the temperature of your showers. Overly hot showers can strip both your skin and hair of moisture and cause breakouts and brittle hair. A mild to moderate temperature shower is still comfortable but doesn’t wreak havoc on your skin’s natural oils. I hope you find some of these tips helpful, but I encourage you to research your own specific needs to make sure you’re treating the needs that your individual beauty requires.